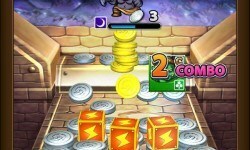 A coin-pusher, for those who haven’t seen one at the arcades, is a game where coins are piled up against a ledge while a mechanism pushes them towards you. The goal is to drop coins at the top so that they push the coins at the bottom over the edge. 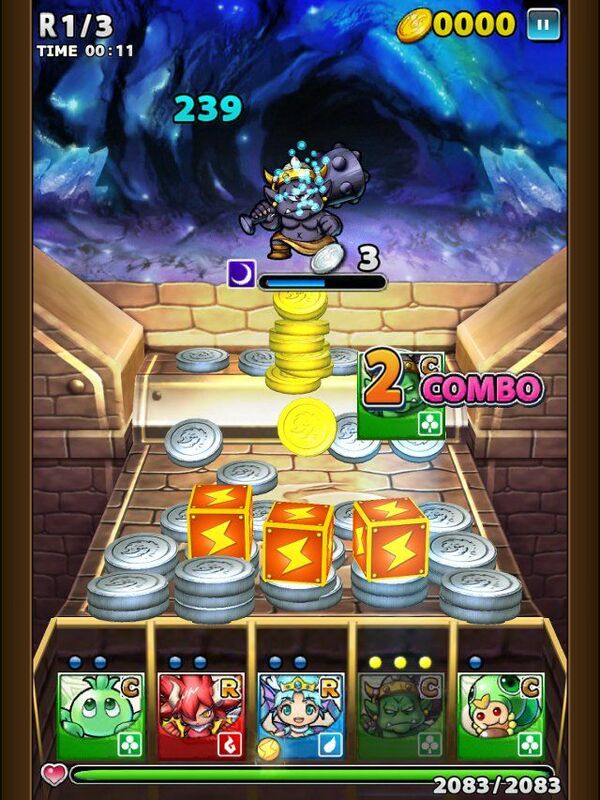 In Dragon Coins, every time this happens, it triggers an attack from your team of collectible monsters. Be prepared to die repeatedly until you give in to the lure of in-app purchases. It’s an interesting concept, one that replaces the random dice rolls or attack values in other RPGs. You can also nudge battles in your direction by dropping coins on one side of the table, or activating power-ups that will raise walls, make the table slippery, increase the speed of the pusher, or perform other enhancements. Dragon Coins’ unusual combat mechanics and collectible monsters are a potent combination. Selecting a winning team is another major aspect of Dragon Coins. In addition to coins, you can collect new monsters trapped in gems, with the rarest giving you stronger attack values and more useful abilities. 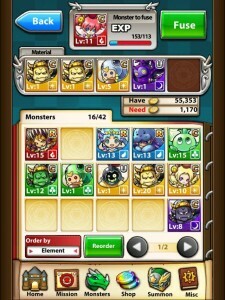 Between levels, you can fuse monsters together to make them stronger, and this eventually changes the artwork. For example, the Munchworm is a cute little grub at first, but it grows up into a frightful-looking battle insect. Leveling up your monsters costs gold coins, which are plentiful, and matches can be fought by spending stamina, which refills over time. However, most of the really useful items have to be purchased with rainbow coins, which are rare and can be bought for real-world money. Dragon Coins offers a lot of levels, but it’s not a smooth progression straight through unless you spend either real money or a lot of time leveling up on easier levels. Be prepared to die repeatedly until you give in to the lure of in-app purchases. You’ll also be asked to make friends with other players so that they join your team and give you attack bonuses, which can certainly get annoying. 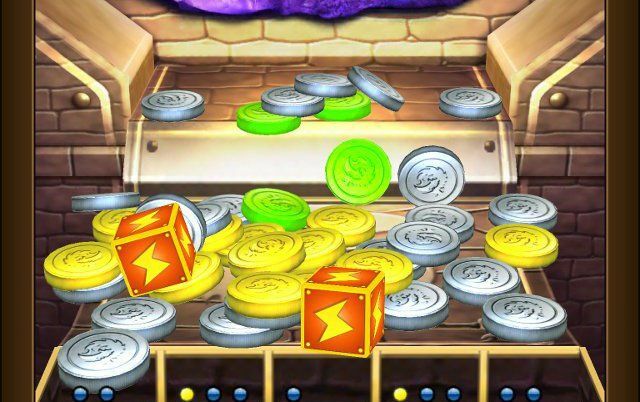 Dragon Coins is a pleasure to look at, with its hypnotic combination of nicely-rendered coins, realistic physics, and a host of adorable characters. It offers a lot of enjoyment for a freemium game, with a unique gameplay mechanic and a generous amount of free content. You’ll probably get snagged by a few annoying gimmicks, like the unnecessarily hard difficulty curve, but Dragon Coins is an enjoyable substitute for the feeling of cashing in. The Good: This clever genre hybrid has attractive coin graphics and physics, plus it offers a nearly endless amount of content for free. The Bad: Frequent freemium trappings, like an imposing difficulty curve and a confusing in-app purchase economy, mask the intent of this game to separate you from your real-life coins. The Verdict: If you can avoid the more undesirable aspects of Dragon Coins by playing part-time and repeating earlier levels, you can have a fun time without spending any money.